The new firm bristles of the medium firm angle are great for painters that are more heavy handed and need more resistance from their brush. 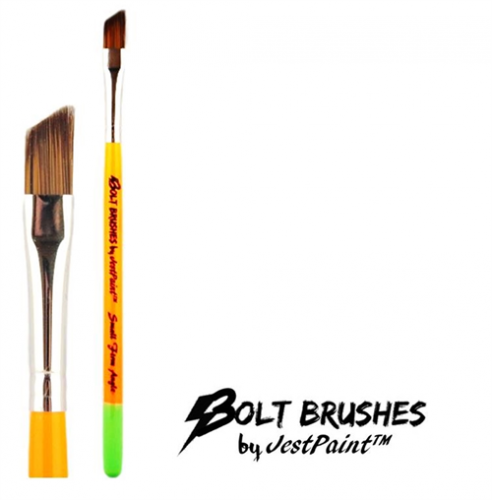 Because the bristles are firmer they require a little bit more water and paint than the medium bounce bristles of the Jest Paint original BOLT brushes. These brushes are also easier to rinse off since they don't hold on to a lot of paint. Jest Paint strive to make the best possible brush for each kind of painter and hope that this new line of firm brushes will be the solution that many have been waiting for. 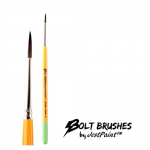 BOLT'S Small Firm Angle brush is perfect for making stripes, thin to thick lines, and little one stroke creations! 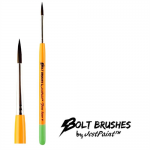 The width of the bristles is about 5/16"
Neon orange, UV reactive, glossy paint job with the handle dipped in green!